The overwhelming majority of SSDs on the market now are based around LSI's SandForce SF2281 controller, but there are also quite a few powered by Marvell's 88SS9174 chip. Both of these bits of silicon have been around for a while, so it's about time we saw some new hardware for either or both companies rather than just firmware updates. First out of the blocks with new hardware is Marvell with the new 88SS9187 Monet controller, which may or may not be the hardware lying under the Indilinx Everest 2 branding in OCZ's Vertex 4 and Agility 4 drive families. In any case, the first drives we have seen flaunting this new silicon come from what many might see as a surprising source - Plextor - in the guise of its new M5 Pro range. A quick glance at the specs reveals that the controller isn't the only thing that's new; these also sport the latest 19nm Toshiba Toggle NAND, making them the first consumer drives to do so. 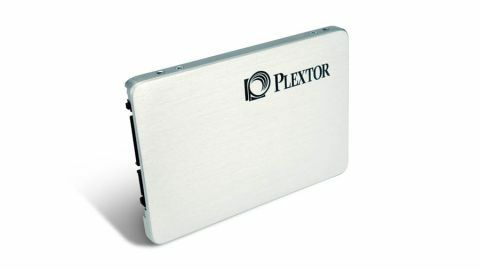 Plextor's M5 Pro range includes two other capacities: the 256GB version and its flagship 512GB drive. It quotes performance figures of up to 540MB/s reads across the board, and while the write performance for the 128GB drive is quoted at up to 340MB/s, both the 256 and 512GB drives get up to 450MB/s. In our tests with the ATTO benchmark, our 128GB backed up the official read figures, posting a score of 545MB/s. Write performance was a little lower than Plextor's figures at 326GB/s. As our benchmarks show, the Plextor M5 Pro can stand up to SandForce drives in outright performance. And when it comes to handling incompressible data writes, it doesn't just hold its own against the likes of the SandForce controlled Patriot Pyro SE - it takes it out into a darkened alley and gives it a good slapping. Not quite as effectively, it has to be said, as the Corsair Performance Pro, but a slapping none the less. But the new controller isn't the only thing special about the M5 Pro. The NAND it uses is pretty special too - 19nm Toshiba fancy Dan Toggle NAND no less. This is the first consumer drive and the first drive we have seen that uses the latest Toshiba NAND, and we're pretty sure it won't be on its lonesome for very long. The 128GB drive uses 256MB of DDR3 cache, and just in case you're wondering, the 256GB version sports 512MB, while in the 512GB drive it goes up to a truly whopping 768MB. It's a brave step for a company to launch a new drive that features not one but two new technologies, but it seems that Plextor has pulled it off with the M5 Pro. And the combination of the new Marvell controller and the latest 19nm Toggle NAND gives it performance that puts it amongst the fastest 120/128GB drives we have tested. It's also reassuring to see that Plextor has plenty of faith in the M5 Pro series backing it as they do with a five-year warranty. When you also consider the fact you're getting both of these new technologies at around £1/GB, you really can't argue with its credentials.